He was an athletic all-round forwarder, could play all position in the front line cover winger in both side, second striker and targeted striker, made him as one of the most completed football players the World has ever seen. He always beat opposing defenders with his high speed, physically power and technical abilities. 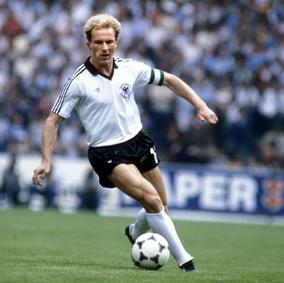 Also, Rummenigge was great in off the ball and finishing. His never-say-die attitude made him a natural captain for his country as 1982 and 1986 FIFA World Cup finalists. He was rated by Kicker Ranking in 3 World-Class seasons plus 5 seasons of International-Class during ten seasons in Bundesliga. Afterwards, He moved to play for Inter Milan 3 seasons by the time he had failed from his prime. In 2005, He was voted in all-time Bayern XI. this stats is low for footballer who haves 2 ballon d'or ! attack , shoot accuracy must be higher and hi was great header .